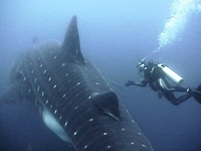 WHALE SHARK XPEDITION to Chale Island. PADI Dive Master, Instructors and other available. to Kisite Marine Reserve and Wasini Island. 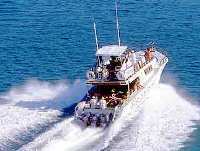 We pick you up from your accommodation in Diani and take you to our flagship, the fastest cruising boat along the Kenyan coast. On our cruise to Kisite Marine Reserve you get great views of Diani Beach, Galu Beach and the skyline of Shimba Hills. 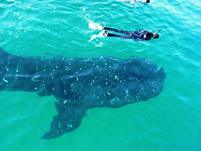 Chale Island, Whale Sharks, dolphins and various marine life are to be see along the way. At Kisite Marine Reserve you can go for a swim, snorkel or dive in the crystal clear water. Lunch on Wasini Island is a feast of fresh king crabs and seafood. After lunch you can explore the island, lazy on the beach, swim or snorkel. to view dolphins and Whale Sharks again. Situated in a tropical palm garden only meters from the Indian Ocean. 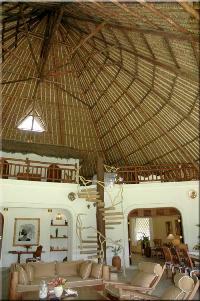 These thatch covered, hard floor lodgings accommodate 1 double and 2 single beds with large veranda for dinning, own private garden, bathroom, refridgerator, ceiling fans and visiting shy Angolian Colobus monkeys. €180.00 (US$245 ZAR18782 GB£156) per day for 1 or 2 persons including breakfast. €20.00 (US$27 ZAR209 GB£17) pp. extra for additional persons. All rooms are spacious and luxurious with en suite bathrooms. Swimming pool, bar, dinning and Internet facilities also available. €45.00 (US$61 ZAR469 GB£39) per single person per day including breakfast. €35.00 (US$48 ZAR365 GB£30) per person per day sharing a double including breakfast. Space, luxury and style. 2 fully air-conditioned en suite bedrooms, gallery that sleeps 4, spacious kitchen, lounge, bar and veranda. Fully services with chef and shopping facilities. Prices on request. Can accommodate up to 8 persons. 2 Villas available. Kenya Travel Diani Beach Tours. Travel in Kenya. Tours and Travel Diani Beach. 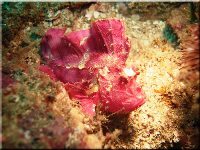 Scuba Kenya. Accommodation Kenya Diani Beach. Whale Shark Kenya. Dolphin cruises in kenya.